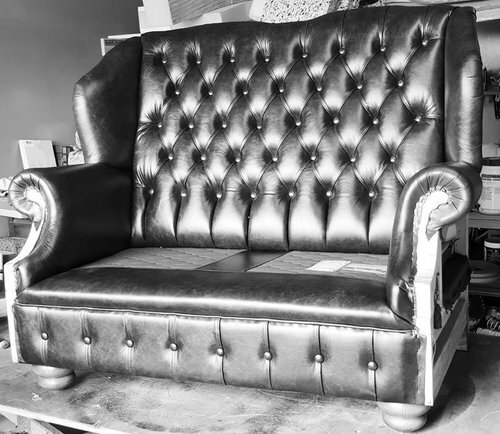 we have had a trend of late for our Slim designed wing back designs but instead of the traditional Queen Anne legs people are asking for a fuller deeper upholstered base more modern couch looking with a lower timber foot. this is our 3rd in as many months. I do like the bun feet. A bit more timeless which fits a chesterfield. I’d love one in Indigo velvet (dreaming). Good luck, it’s quite ugly, sorry just being honest. 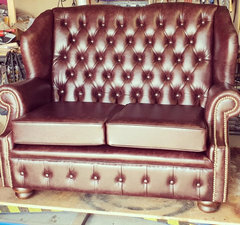 I would finish the upholstery and add the cushions before seeking feedback. At the moment it looks poorly proportioned, and a bit rough, as it is only half complete. A lot of people would not appreciate it is a work in progress, and can't visualize the finished piece, so may make negative comments. and don't just glorify photos of imports and take credit and pretend we make them as many others in this industry now sadly do. Floor plan: open concept or closed?